Pearl Harbor was not an accident, a mere failure of American intelligence, or a brilliant Japanese military coup. It was the result of a carefully orchestrated design, initiated at the highest levels of our government. According to a key memorandum eight steps were taken to make sure we would enter the war by this means. Pearl Harbor was the only way, leading officials felt, to galvanize the reluctant American public into action. This great question of Pearl Harbor--what did we know and when did we know it?--has been argued for years. At first, a panel created by FDR concluded that we had no advance warning and should blame only the local commanders for lack of preparedness. More recently, historians such as John Toland and Edward Beach have concluded that some intelligence was intercepted. Finally, just months ago, the Senate voted to exonerate Hawaii commanders Admiral Kimmel and Lieutenant General Short, after the Pentagon officially declared that blame should be "broadly shared." But no investigator has ever been able to prove that fore-knowledge of the attack existed at the highest levels. Until now. After decades of Freedom of Information Act requests, Robert B. Stinnett has gathered the long-hidden evidence that shatters every shibboleth of Pearl Harbor. It shows that not only was the attack expected, it was deliberately provoked through an eight-step program devised by the Navy. Whereas previous investigators have claimed that our government did not crack Japan's military codes before December 7, 1941, Stinnett offers cable after cable of decryptions. He proves that a Japanese spy on the island transmitted information--including a map of bombing targets--beginning on August 21, and that government intelligence knew all about it. He reveals that Admiral Kimmel was prevented from conducting a routine training exercise at the eleventh hour that would have uncovered the location of the oncoming Japanese fleet. And contrary to previous claims, he shows that the Japanese fleet did not maintain radio silence as it approached Hawaii. Its many coded cables were intercepted and decoded by American cryptographers in Stations on Hawaii and in Seattle. The evidence is overwhelming. At the highest levels--on FDR's desk--America had ample warning of the pending attack. At those same levels, it was understood that the isolationist American public would not support a declaration of war unless we were attacked first. The result was a plan to anger Japan, to keep the loyal officers responsible for Pearl Harbor in the dark, and thus to drag America into the greatest war of her existence. Yet even having found what he calls the "terrible truth," Stinnett is still inclined to forgive. "I sympathize with the agonizing dilemma faced by President Roosevelt," he writes. "He was forced to find circuitous means to persuade an isolationist America to join in a fight for freedom....It is easier to take a critical view of this policy a half century removed than to understand fully what went on in Roosevelt's mind in the year prior to Pearl Harbor." Day of Deceit is the definitive final chapter on America's greatest secret and our worst military disaster. Historians have long debated whether President Roosevelt had advance knowledge of Japan's December 7, 1941, attack on Pearl Harbor. 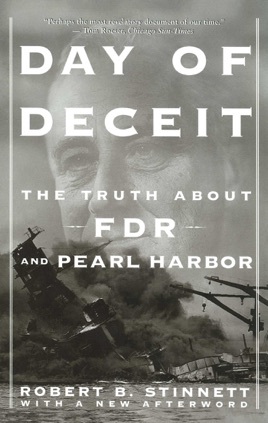 Using documents pried loose through the Freedom of Information Act during 17 years of research, Stinnett provides overwhelming evidence that FDR and his top advisers knew that Japanese warships were heading toward Hawaii. The heart of his argument is even more inflammatory: Stinnett argues that FDR, who desired to sway public opinion in support of U.S. entry into WWII, instigated a policy intended to provoke a Japanese attack. The plan was outlined in a U.S. Naval Intelligence secret strategy memo of October 1940; Roosevelt immediately began implementing its eight steps (which included deploying U.S. warships in Japanese territorial waters and imposing a total embargo intended to strangle Japan's economy), all of which, according to Stinnett, climaxed in the Japanese attack. Stinnett, a decorated naval veteran of WWII who served under then Lt. George Bush, substantiates his charges with a wealth of persuasive documents, including many government and military memos and transcripts. Demolishing the myth that the Japanese fleet maintained strict radio silence, he shows that several Japanese naval broadcasts, intercepted by American cryptographers in the 10 days before December 7, confirmed that Japan intended to start the war at Pearl Harbor. Stinnett convincingly demonstrates that the U.S. top brass in Hawaii--Pacific Fleet commander Adm. Husband Kimmel and Lt. Gen. Walter Short--were kept out of the intelligence loop on orders from Washington and were then scapegoated for allegedly failing to anticipate the Japanese attack (in May 1999, the U.S. Senate cleared their names). Kimmel moved his fleet into the North Pacific, actively searching for the suspected Japanese staging area, but naval headquarters ordered him to turn back. Stinnett's meticulously researched book raises deeply troubling ethical issues. While he believes the deceit built into FDR's strategy was heinous, he nevertheless writes: "I sympathize with the agonizing dilemma faced by President Roosevelt. He was forced to find circuitous means to persuade an isolationist America to join in a fight for freedom." This, however, is an expression of understanding, not of absolution. If Stinnett is right, FDR has a lot to answer for--namely, the lives of those Americans who perished at Pearl Harbor. Stinnett establishes almost beyond question that the U.S. Navy could have at least anticipated the attack. The evidence that FDR himself deliberately provoked the attack is circumstantial, but convincing enough to make Stinnett's bombshell of a book the subject of impassioned debate in the months to come.